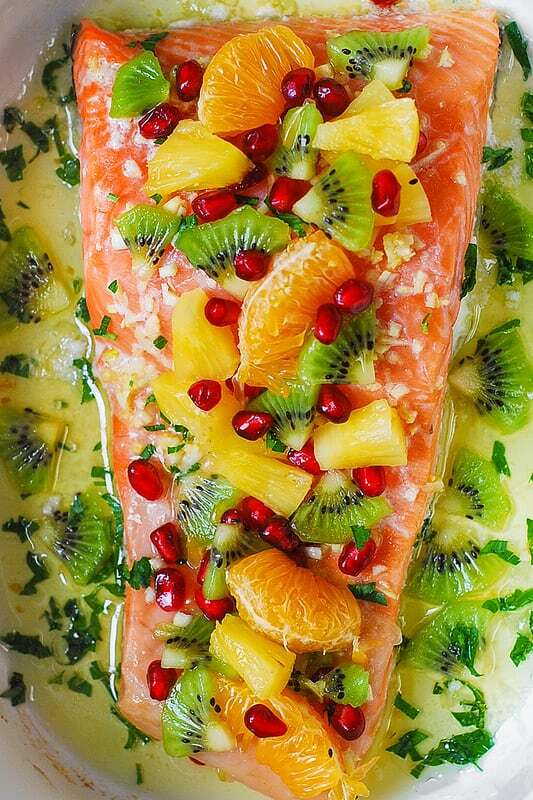 Garlic Lime Salmon with Honey-Lime Pineapple Salsa – easy and delicious! The salmon is baked with garlic, fresh lime slices, and butter. 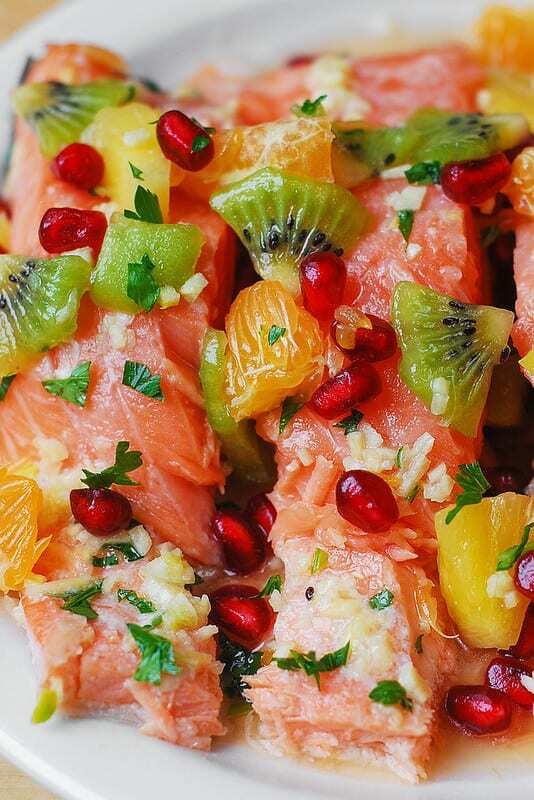 Topped with Pineapple, Mandarin Oranges, Pomegranate, and Kiwi Salsa with Honey-Lime Sauce. It’s winter right now, and during these cold months I always make sure that my dinner menu includes lots of healthy stuff, including food containing Vitamin C and antioxidants. This recipe is perfect for these cold winter months when we need a lot of nutrients for our bodies! 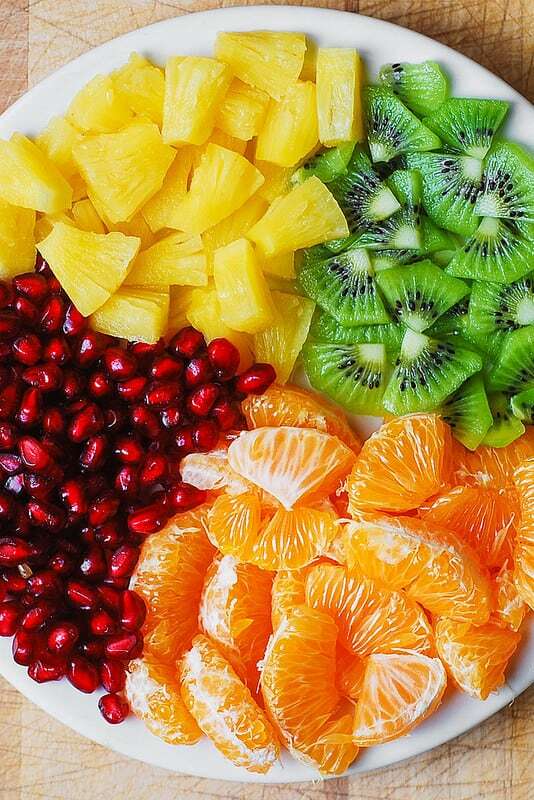 The salsa ingredients are rich in Vitamin C and antioxidants: pomegranate seeds, pineapple, mandarin oranges, kiwi. 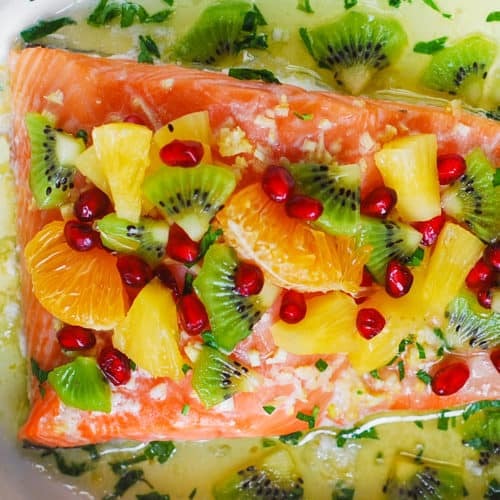 The salmon is baked with fresh lime and with lots of garlic. Lots of good stuff in this little recipe! I used a very large salmon fillet (it was about 1 1/2 lb) with skin-on. It was a perfect size for my medium casserole dish. Of course, this recipe works just the same with smaller salmon fillets, as long as they are about 1 1/2 to 2 lb in total weight. But, I start making this recipe by preparing pineapple salsa first, before I cook the fish. How do you make pineapple salsa? So easy! First, you combine diced pineapple, mandarin oranges, sliced kiwi and pomegranate seeds in a medium bowl. Then, in a smaller bowl, whisk together warm honey and lime juice. Add honey lime mixture to the bowl with fruit, mix everything gently, and your delicious pineapple salsa is ready! It’s super refreshing and goes very nicely with garlic lime salmon. What is a good side dish to have with salmon? You’ll never make a mistake if you serve rice with this garlic lime salmon. 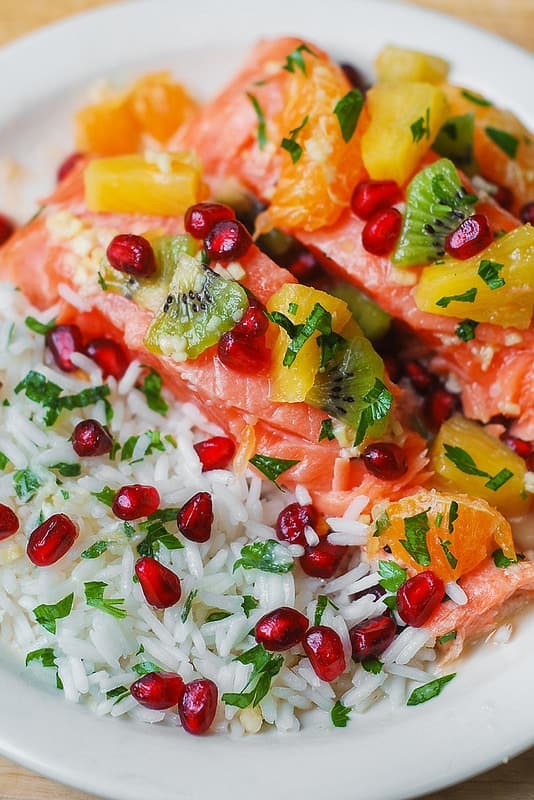 I cooked jasmine rice, then poured garlic lime butter juices from cooking salmon over the rice and topped it with extra pomegranate seeds. Jasmine rice with all that garlic butter sauce and pomegranate seeds makes a great presentation, and it’s very tasty, too. How long and at what temperature do I bake salmon? What if you want some veggies in your diet, so what vegetable to serve with this lime salmon? Steamed asparagus is always great. Or, you can also try these delicious Asiago cheese roasted broccoli – they are so good and crunchy! Also, for a more comforting side dish – try these easy scalloped potatoes. 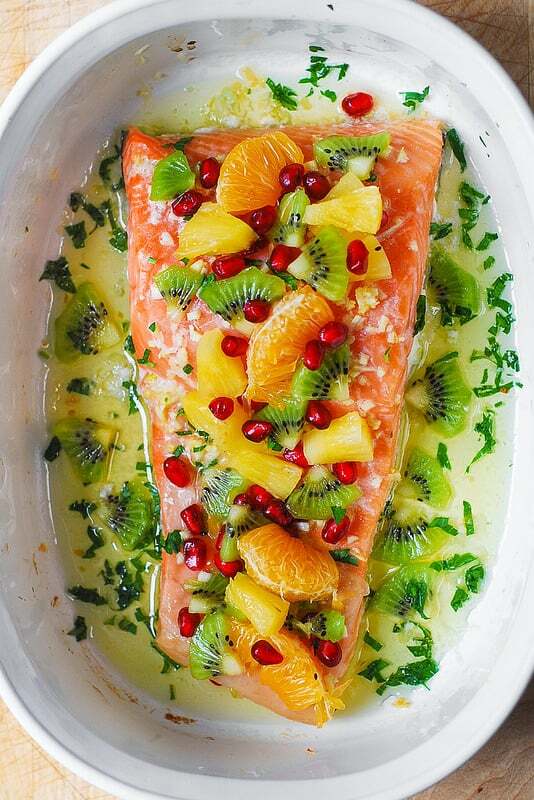 The salmon is baked with garlic, fresh lime, and butter. 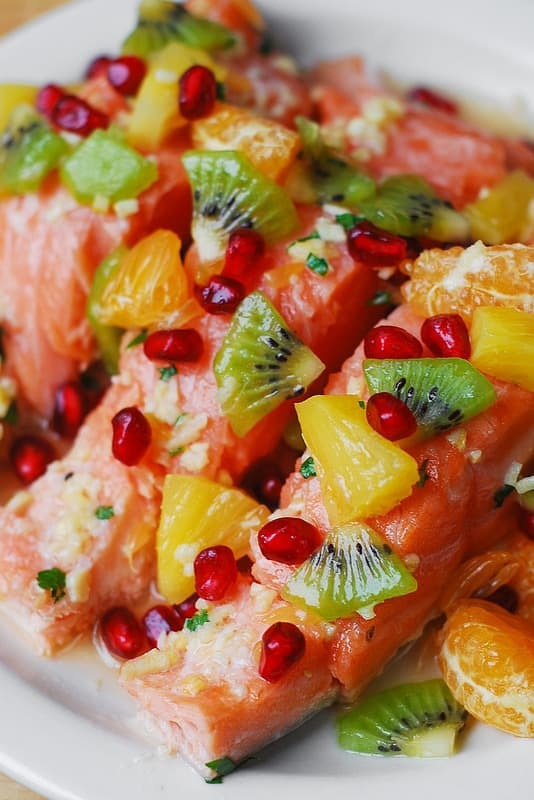 Served with Jasmine rice and topped with Pineapple, Mandarin Oranges, Pomegranate, and Kiwi Salsa tossed with Honey-Lime Sauce. YUMMY! In a medium bowl toss together segmented mandarin oranges, sliced kiwi, diced pineapple, and pomegranate seeds. Make the dressing: in a mixing bowl, squeeze the juice of 1/2 of fresh lime, add softened honey and whisk together until well-combined. Pour over the fruit and toss to combine. Top salmon with minced garlic. Add lime slices all around. Top with sliced butter, unmelted. Bake uncovered for about 20 minutes or longer (depends on your oven), or until the salmon is cooked through. Remove from the oven. Remove lime slices from the casserole dish. Pour the salsa over cooked salmon.